Harold “Hal” Ray Wing, was the founder of Wing Enterprises and creator of The Little Giant Ladder System, the largest manufacturer of American-made ladders. He was a member of The Church of Jesus Christ of Latter-day Saints. Wing's business was inspired by a German ladder prototype in the 1970s. He brought the idea back to the United States, patented it and began Wing Enterprises in his garage. Initially he sold it at trade shows. 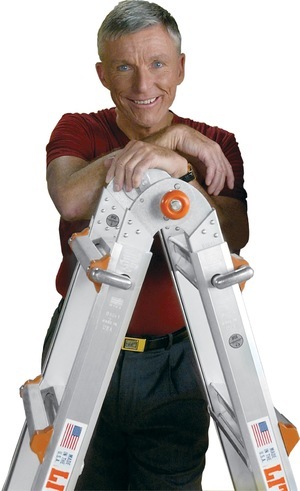 Within the first year, he sold more than a $500,000 worth of ladders. During his career, Wing was named to the Utah Valley Entrepreneurial Forum Hall of Fame, Who's Who in the World, Who's Who in the West, Who's Who in Finance and Industry, Men of Achievement, and the 2005 Ernst and Young Entrepreneur of the Year. He also served in both U. S. presidents Ronald Reagan's and George H.W. Bush's administrations as a representative at several national conferences on small business. He was also mayor of Springville, Utah—his hometown—from 1997 to 2001. He loved cars and motorcycles. His collection of historic and pristine cars numbered 100 at its peak. He enjoyed music and played the bugle. He also knew how to yodel and once made a CD of his yodels. Wing was known for his generosity to employees, friends, and strangers. He quietly helped many people and organizations. In 2011, work was completed on Utah Valley University's new Hal Wing Track and Field complex. He made a sizable donation to fund and build the complex at the university. Wing and his wife Brigitte Mayer Wing raised seven children. He died on August 6, 2012, at the age of 72. This page was last edited on 18 February 2014, at 14:52.